Technology is everywhere, and whether you embrace it whole-heartedly in every facet of your life, or are ready to chuck it all off your balcony and live your life off the grid in the middle of a remote land, one thing’s for sure—it is here to stay, my friends. And while it can be frustrating at times (I wonder how many phones are in the bottom of the Rhein? ), it is nothing short of miraculous what some people have done with it, and the possibilities technology offers. 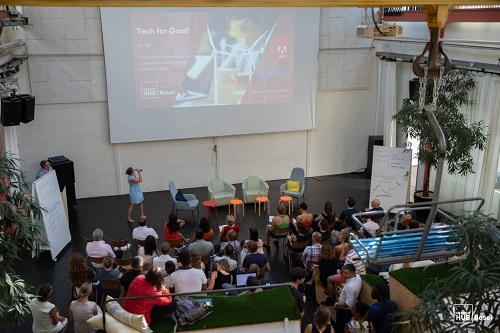 Our exciting August event, “Tech for Good” brought this point home. What are some examples of tech being used for good? Look no further than one of our parters that evening, Powercoders. Born out of a desire to do something about the refugee crisis, Powercoders provides 3-month intensive training programs for refugees. Working with coaches and IT companies, they provide support throughout a 6-12 month internship, with the final goal being to not only arm them with job skills, but to give people their independence back, reduce social welfare costs and fill the gap of open job positions in the IT-industry. In a nutshell—it’s awesome. Want to get involved? Click here. Solutions like Powercoders address some of the greatest challenges of today with simple, user-centric tech/digital solutions that can be replicated to address problems—and not necessarily Blockchain or Artificial Intelligence. Who are the people doing tech for good? 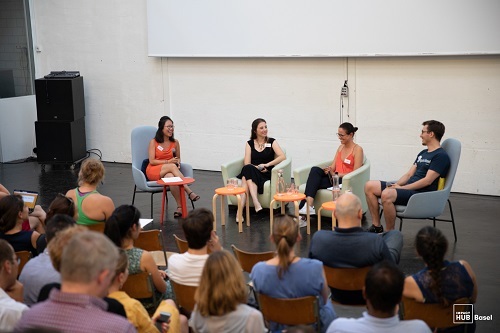 Manon Stöver, shared her experience in helping equalize the male/female ratio in tech jobs. In addition to being a Geothermal Engineer, Manon found her way to “We Shape Tech” because she attended their event in November 2017 and was immediately a fan. We Shape Tech fosters potential in women for tech, and wants to shape the future of technology to be more inclusive. Curious to learn more? You’ll find their events (3-5 per year) and other goodies here.